The box jellyfish: Why are they so deadly? The box jellyfish is a collective term for a class of species under the Medusozoa subphylum and Cnidaria phylum under the greater Animalia kingdom. These animals are distinguishable for having a cube-shaped bell or medusae while they are in their medusa form. Nonetheless, the collective species have earned a reputation for being one of the deadliest animals and sea creatures in the world. But why the box jellyfish are so deadly? For starters, not all box jellyfish are deadly. Of at least 51 species, there are a few that produce extremely potent venom. In fact, some species do not pose a serious threat at all. However, the deadly ones have caused a number of fatalities, thus prompting officials to devise and issue blanket protocols for avoiding jellyfish stings. Other species of box jellyfish have also been discovered to be potentially fatal to humans. These are the Chironex yamaguchi or habu-karage found in the coastal waters of Japan and some parts of the Philippines; and the Chiropsalmus quadrumanus or the four-handed box jellyfish the western Atlantic Ocean, the Gulf of Mexico, and the Pacific Ocean. The aforementioned species of box jellyfish have been documented to have caused extremely painful stings to humans and in other cases, human fatalities. The reason why their sting can be deadly centers on their extremely highly potent venom. Note that the venom of the box jellyfish is different from that of Scyphozoa, another class of species under the Medusozoa subphylum and Cnidaria phylum that are also known as true jellyfish. To be specific, the box jellyfish produces and uses extremely potent venom both to catch prey and seriously harm or kill predators. The tentacle of the box jellyfish can reach up to 10 feet. Hence, it can be regarded as another reason why these animals can be dangerous to humans. Each tentacle has about 5000 to 10000 nematocysts or stinging cells that are triggered not by touch but by the chemicals found on the outer layer of its prey or predator, including the chemicals found on the human skin. Mobility and other adaptive capabilities are other reasons why the box jellyfish are generally regarded as deadlier than other species of Medusozoa. Unlike the true jellyfish, the species of box jellyfish have developed the ability to move rather than simply drift. They can move as fast as 4mph to catch their prey. Furthermore, these species have four sets of six eyes used for scanning their surroundings and hunting their prey or responding against a threat. What happens when a box jellyfish stings? Nevertheless, once the tentacle of the box jellyfish adheres to human skin, the nematocysts on its surface inject microscopic harpoons at speeds of more than 60km/h that on the other hand. Each harpoon pumps venom further inside the human body. The sting and the subsequent introduction of the venom inside the body immediately trigger an allergic reaction and an agonizing pain. Victims have described the sensation as if the affected areas of their bodies have been subjected to hot and burning oil. This extreme pain can leave some individual frightened and if they happen to be swimming in seawaters, can immediately cause drowning due to mental distress. But what is with the venom of the box jellyfish that makes it deadly? Take note that a venom is a secretion that contains one or more toxins. Different venomous animals produce different venoms with different compositions. 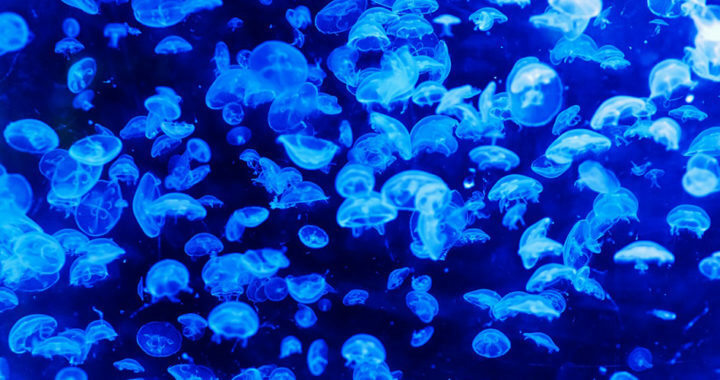 In the case of the box jellyfish, especially the deadly variants, their venom contains neurotoxins that attack and destruct nerve tissues, as well as cytotoxins or pore-forming toxins that cause local tissue damages. These toxins are primarily responsible for the immediate and extremely painful sensation. A more specific type of toxin found in the venom is the molecule called porin. Several studies have attributed the potency and deadliness of box jellyfish venom to this molecule. Accordingly, porin crosses cellular membranes and allows substances to exit and enter cells. This molecule also explains why the venom triggers a cardiac arrest. To be specific, once the venom reaches the heart, the porin punctures red blood cells and cause potassium to leak out. Prolonged exposure to porin can drive down the potassium level in the blood, thus leading to hyperkalemia that in turn, can lead to a cardiac arrest. In some cases, those who have survived the immediate effects of the venom from a box jellyfish can develop an internal reaction called Irukandiji syndrome in which the body releases large volumes of stress hormones and inflammation proteins as part of of immune response and systematic reaction to the toxins from the venom. The condition is characterized by an array of systematic symptoms to include pain in different parts of the body, nausea, vomiting, hypertension, and anxiety, among others. Take note that severe cases of this syndrome can lead to death as well.